Singapore: Star Indian shuttlers PV Sindhu, Saina Nehwal and Kidambi Srikanth eased into the second round of the $355,000 Singapore Open with straight-game wins over their respective rivals in the singles event on Wednesday. Taking the court first, Sindhu, seeded fourth, took just 27 minutes to get the better of Indonesia's Lyanny Alessandra Mainaky 21-9, 21-7 in a one-sided match. The Rio Olympics silver-medallist will next play Mia Blichfeldt of Denmark. Later, sixth seed Saina too tamed another Indonesian in Yulia Yosephin Susanto 21-16, 21-11, to book her place in the next round. Saina, who won a bronze in the 2012 London Olympics, will next look to avenge her first-round loss at Malaysia Open to Thailand's Pornpawee Chochuwong when she faces her in the second round. Chochuwong beat young Indian Mugdha Agrey 21-6, 21-8 in another match. 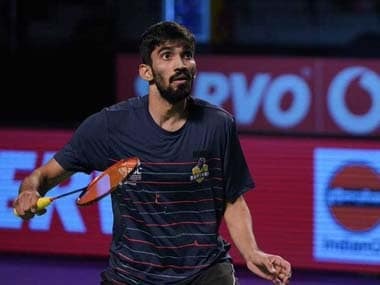 Sixth seed Kidambi Srikanth, who had reached the finals at India Open, defeated Thailand's Sitthikom Thammasin 21-17, 21-18 in a 41-minute match. He will next lock horns with Denmark's Hans-Kristian Solberg Vittinghus. 2014 Commonwealth Games champion Parupalli Kashyap, who had reached the semi-finals of the India Open last month, continued his good run with a 21-19, 21-14 win over world number 28 Rasmus Gemke of Denmark to set up a clash with Olympic champion Chen Long of China. Sameer Verma defeated Thailand's Suppanyu Avihingsanon 21-14, 21-6 to square up against China's Lu Guangzu. HS Prannoy eked out an 11-21, 21-16, 21-18 win over France's Brice Leverdez. The Indian will meet top seed and world no 1 Kento Momota of Japan next. Momota survived a scare against 2017 champion B Sai Praneeth, who put up a stiff resistance before going down 21-19, 14-21, 20-22 to the reigning Japanese World champion. Pranaav Jerry Chopra and N Sikki Reddy also progressed to the mixed doubles second round event after beating Arjun M R and K Maneesha 21-18-21-7 in an all-Indian contest. The Chinese Taipei pair of Lu Ching Yao and Lee Chia Hsin ended the campaign of Venkat Gaurav Prasad and Juhi Dewangan 21-12, 21-15.